"guettel And Lucas Step Into --the Light, With Rapturous"" Results"
Adam Guettel was looking for a love story. It was late 1998, and the acclaimed composer- lyricist of such haunting and startling music theater pieces as FLOYD COLLINS and MYTHS AND HYMNS was looking to challenge himself in a new way. The sounds of being in love were waiting to spill out of me, he told the San Diego Union-Tribune earlier this year. I wanted to find a vessel for those sounds, a story to put those sounds in where it was primary source material. It was Guettels mother, Mary Rodgers, who suggested THE LIGHT IN THE PIAZZA. She said she remembered something from The New Yorker, and I should look it up and see if it was in print, Guettel recalled to Playbill. So I read it, and I really fell in love with it right away which doesnt always translate into wanting to stick with an idea. But the bells kept ringing. 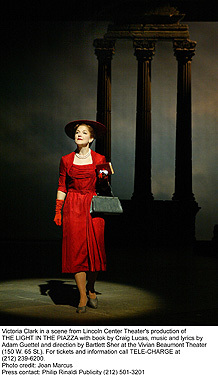 Guettels infatuation paid off, and in June 2003, Seattles Intiman Theatre hosted the world premiere of a new musical: THE LIGHT IN THE PIAZZA, with music and lyrics by Guettel, and a book by Craig Lucas. This rapturous musical, wrote the Seattle Times, is a beguiling tale retold with humor, poignancy and musical interludes of shivery loveliness. The Seattle News Tribune reported that each performance lasts only two hours...Yet those two hours are the theater event of the season. Elizabeth Spencer has been one of Americas foremost novelists and short-story writers for over half a century. After spending several years in the burnished Tuscan hills in the early 1950s, she returned to America and wrote her best-known work, THE LIGHT IN THE PIAZZA, which was first published in The New Yorker in June of 1960, and in book form a few months later. Within two years it was made into a Hollywood film starring Olivia de Havilland, George Hamilton and Yvette Mimieux. Like gold sparkling in a stream, its musical theatre potential was always there, just waiting to be discovered. An early indication of this can be found in a letter from Oscar Hammerstein II to a member of the public, who had suggested that Rodgers and Hammerstein consider musicalizing the Spencer work. It is a charming story and a tantalizing one, Hammerstein responds. It is difficult for me to get out of my head, and difficult for me to make up my mind about It would be difficult, I believe, for us to adapt it as a musical play, but it is a tempter... The letter is dated July 6, 1960. Hammerstein died six weeks later. But Mary Rodgers had read the story too, and believed it would make a fine musical. She held to that notion for four decades and eventually, though her father said no, her son said yes. The next step was getting Elizabeth Spencer to say yes also. After meeting with Adam and hearing his musical vision for the piece, the author gave her blessing. I felt from the minute I met Adam that he had what was right, Spencer told opera News. THE LIGHT IN THE PIAZZA is set primarily in Florence in 1953, and focuses on the interrelationships between Margaret, an independent-minded American matron: her fully-grown yet child-like daughter Clara: a handsome local boy, Fabrizio, with whom Clara falls in love; and Fabrizios Florentine family. For Guettel it was the complexity of the characters. and the intensity of their emotional journey that drew him to Spencers story. There was a quality of emotional ambition. he told the Seattle Weekly, of reaching for the real thing. [The story] seemed to beautifully depict that the ecstasy of first love and the agony of loss are the same feeling, by a different name...One of the great things about Elizabeth Spencers work is what she doesn't say he continued. To not say the same stuff in a different medium is a very complicated, delicate process...What is withheld in love is always the most captivating thing. But even as he was falling under the spell of PIAZZA, Guettel needed a collaborator to share his vision and bring the story to life on the musical stage. After a few false starts with prospective collaborators, however, Guettel became discouraged, and considered abandoning the project. Then one day. with no particular plan in mind, he played a few songs for his friend Craig Lucas. Lucas, author of the plays PRELUDE TO A KISS and BLUE WINI)OW and such screenplays as LONGTIME COMPANION and this years ThE SECRET LIVES OF DENTISTS, had a visceral reaction to what he heard. I think of Adam as God, he told the Seattle Post Intelligencer. I was sobbing...Then and there. I decided I had to write the book for the show Guettel was equally enthusiastic about Lucas. Craig saved my life, he told the San Diego Union-Tribune. The show was in a drawer I was going to make it into a little orchestral suite or something. I felt I failed, and just couldnt find the right collaborator. I didnt know what I was doing with my life because I didnt have a project and I didnt have a collaborator...Craig convinced me to take it up again. Guettel and Lucas began to shape and develop their musical, and their individual approaches to the story dovetailed perfectly: Adam entered the story through Claras head. Lucas told the newspaper. The S/ranger. I was more interested in her mother, Margaret, the type of 1950's woman who went to Radcliffe, then got married and made some quiche. There was something in her that I hadnt seen dramatized the difficulty in letting go of ones child. In the Post-Intelligencer, he explained [The novella] is written as interior monologue. But there are eight characters. So the interactions among the characters turn into dialogue. And the monologues are the basis for the songs. It is the musical structure encasing those songs that Guettel described to readers of a Play Guide provided by the Intiman: The traditional aspects of this score are that there are set pieces, songs that have book scenes around them and are set up in a conventional way. but also there are extended musical sequences we have duos, trios, quintets, an octet, many solos and a lot of underscoring which connects many of these numbers,,,[The work] is not through composed in the sense that people have come to think of it in the musical theatre, but more thematically connected. As these set pieces have grown, what has grown around them is less conventional and more operatic. I think we have offered our audiences some of both worlds. compromise, [ThE LIGHT IN THE PIAZZA] may bring this astonishing composers music a step closer to popular acceptance. in part by retuning that audiences ears. The score draws about equally from the modernist traditions of Gabriel Faur, the musical theater of Stephen Sondheim. and David Brubeck-style jazz. It had taken five years from Guettels first encounter with the Spencer novella to the Seattle premiere. Along the way. a retreat for Guettel and Lucas at an artist colon) (U-Cross in Wyoming) led to a reading at the Sundance Theater Lab in Utah in the Summer of 2002,. where it was seen by among others, Bartlett Sher. Artistic Director of the lntiman Theater. Sher had already invited Lucas to be an Associate Director at the Intiman, and now offered his theater for PIAZZA's world premiere. 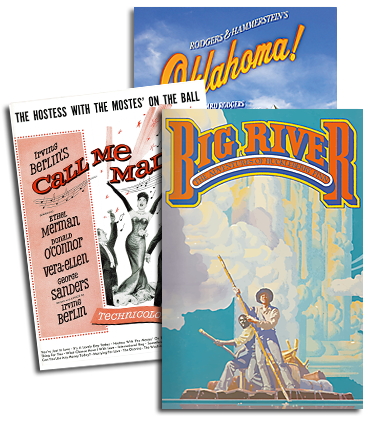 where it would eventually be presented in association with Chicagos Goodman Theater. The superb cast assembled for that premiere included Victoria Clark as Margaret. Celia Keenan-Bolger as Clara and Steven Pasquale as Fabrizo. Lucas directed that production. choreographed by Pat Graney with orchestrations by Guettel and Ted Sperling, conducted by Sperling. Seattle embraced PIAZZA critics and audiences alike debated whether it was a musical or a chamber opera. and whether its prospects were in the commercial or non-profit sectors.,.But in the midst of it all. Guettel and Lucas simply kept working and fine-tuning, readying their work for its next engagement, at the Goodman Theater earl) next year, Working in this field is about being with wonderful actors and wonderful collaborators, Guettel told the Seattle Weekly, accepting that we now culturally speaking. are holding a candle in the dark, and theres nothing wrong with that.